A cryptocurrency (or crypto currency) is a medium of exchange using cryptography to secure the transactions and to control the creation of new units. Cryptocurrencies are a subset of alternative currencies or specifically of digital currencies. Bitcoin became the first decentralized cryptocurrency in 2009. Since then, numerous cryptocurrencies have been created. Cryptocurrencies typically feature decentralized control (as opposed to a centralized electronic money system, such as PayPal) and a public ledger (such as bitcoin's block chain) which records transactions. The alternative cryptocurrencies launched after the success of bitcoin are frequently called altcoins. Bitcoin is a payment system invented by Satoshi Nakamoto, who published the invention in 2008 and released it as open-source software in 2009. The system is peer-to-peer; users can transact directly without needing an intermediary. Transactions are verified by network nodes and recorded in a public distributed ledger called the block chain. The ledger uses its own unit of account, also called bitcoin. The system works without a central repository or single administrator, which has led the US Treasury to categorize it as a decentralized virtual currency. Bitcoin is often called the first cryptocurrency, although prior systems existed. Bitcoin is more correctly described as the first decentralized digital currency. It is the largest of its kind in terms of total market value. Bitcoins are created as a reward for payment processing work in which users offer their computing power to verify and record payments into a public ledger. This activity is called mining and the miners are rewarded with transaction fees and newly created bitcoins. Besides mining, bitcoins can be obtained in exchange for different currencies, products, and services. Users can send and receive bitcoins for an optional transaction fee. Bitcoin as a form of payment for products and services has grown, and merchants have an incentive to accept it because fees are lower than the 2–3% typically imposed by credit card processors. Unlike credit cards, any fees are paid by the purchaser, not the vendor. The European Banking Authority and other sources have warned that bitcoin users are not protected by refund rights or chargebacks. Despite a big increase in the number of merchants accepting bitcoin, the cryptocurrency doesn’t have much momentum in retail transactions. [Published on Jul 15, 2014] You've probably heard a lot about Bitcoin in the news lately. But what is it and why does it matter? Let's take a look at the evolution of money to find out. If cryptocurrencies are the future of money, those who adopt it last might unfortunately be left hanging. However, as cryptocurrency researcher Andreas Antonopoulos points out, somewhere around 6 billion people are "unbanked" — i.e. already not using banks in any way, and therefore are likely to be more willing and easily able to adopt cryptocurrency, particularly in places where smartphones are becoming easier to find than proper food. It's also unfortunate that rich investors have more capability of buying bitcoins. However, the rich also have the greatest incentive to keep the debt-based fiat financial system afloat, and thus generally will approach cryptocurrencies, if at all, purely as an investment, and a risky one at that. Decentralized digital money is made possible by a specific tecnhological breakthrough: Satoshi Nakamoto's solving of the double-spending problem. Prior to this milestone in cryptographic technology, it was considered impossible to prevent double-spending, i.e. duplicating a transaction (using copy and paste) and sending funds to recipient A and B at the same time, without a centralized authority to determine which double-spent transactions are invalid/fraudulent. The solving of this fundamental problem — via the invention of the blockchain decentralized ledger technology — enables not only decentralized digital cash, but opens a whole new era of technological innovation. Consider also: Why bitcoin qualifies as money while the dollar is just currency. Investors love to say that "Bitcoin has no intrinsic value", but are unable to explain why something requires "intrinsic value" to be valuable, or even what the parameters that define "intrinsic" are. "But I can't touch it! ", some people will retort. But there are many valuable things you don't touch, and when you are touching paper money you are really just touching a piece of paper — the value is a derivation. But, to cover that belief too, there is already a cryptocurrency backed by physical gold: AurumCoin, which is "a digital way to liquefy gold". Money is the actualization of a protocol governing the communication of financial transactions between individuals. It is merely an invention of early man to enable him to store his value (labour) in an inanimate portable un-perishable divisible fungible unit of account that originates in the free market and is sought after by other individuals due to its scarcity, so that he may be able to exchange it at a later time for something of his needs or wants. It is obvious that cryptocurrency is (so far) the greatest invention of the 21st century, because it completely eliminates the need for banks. Ideas like third-party money management are now, technically speaking, technologically obsolete. Do we ride horses when we have the internal combustion engine? • Bitcoin's most significant characteristic is that it is decentralized, meaning that there is no central bank or authority (other than mathematics) that can have any direct influence on the system. Decentralization is the antithesis to/of "authority", which relies entirely on centralized systems. The network is secured by a complex — but well-defined and completely open for everyone's examination — set of mathematical operations known as cryptographic hash functions run on application-specific integrated circuits (ASICs). Decentralization means no single point of failure, and decentralized commodity money is only the beginning of the crypto revolution. Decentralized free markets with decentralized escrow, decentralized autonomous corporations/organizations, decentralized prediction markets, and probably even decentralized derivatives, are only "a matter of time". • Bitcoin is open source, and free software (FOSS), meaning that its code can be examined by any interested coder anywhere in the world — ensuring that nothing nasty can be hidden in the code for long, were the spooks to compromise the code in some way. The core service of bitcoin is censorship resistance. All else follows from that. • Even when paying an optional fee to expedite the transaction confirmations, the Bitcoin payment system is close to free — or will at least remain almost-free for many years, with transaction fees ranging from less than a dollar cent to a few cents. Merchants can charge fees for their services as they see fit, of course, but (in the spirit of the Bitcoin project) as of 2015 fees for all Bitcoin services are much lower than those charged by banks and payment services such as PayPal. • Bitcoin is a "trustless", consensus-based distributed system. Though commonly used, the term "trustless" is a bit misleading, because what it really means is "no trust in humans is required", because trust (security) is provided by the computational power of the majority of participating nodes of the network. If a malicious client (attacker) tries to submit fraudulent transactions (or modified blocks) to the network, it will be automatically rejected by consensus majority. Whichever blockchain is the majority one is the winner. Only if an attacker could manage to get control over more than 50% of the network's computing power would the attacker be able to double-spend and harm the network's integrity by means of compromising trust/security. This vulnerability vector, known as a 51% attack, was at one time thought to be a major one, but is no longer considered to be a major weakness. • When compared to the dinosaur banking system, Bitcoin is fast, in that (confirmation of) transactions take anywhere between a few minutes to a few hours (or sometimes several hours if no fees are included in the transaction). The user can add an optional tiny fee to give an individual transaction higher priority. In any case it is much faster than so-called "bank transfers" currently are, wherein banks will often hold the funds as an asset for a few days — one of the many methods banks use to extract value. Because creating (or “mining“) blocks is so crucial to the security of the Bitcoin network and yet so hard, the Bitcoin protocol includes a mechanism to encourage people to mine: every time a block is added, the miner who found the block is given 50 BTC as a reward. There is also another mechanism to encourage mining called transaction fees, which will grow in importance in the far future, but for now, the block reward is by far the largest financial incentive to encourage people to participate in the block creation process. The block reward also has another function; it the only way that new bitcoins come into existence. Any bitcoin that you send or receive was at one point somebody’s block reward. The main reason why [block reward halving] was done is to keep inflation under control. One of the major faults of traditional, “fiat“, currencies controlled by central banks is that the banks can print as much of the currency as they want, and if they print too much, as happened in Weimar Germany in 1923 and Zimbabwe in 2007 (among many other unfortunate examples), the laws of supply and demand ensure that the value of the currency starts dropping quickly. Because the only use for money is to exchange it for something else later, a currency that is rapidly decreasing in value becomes even less valuable for that very reason, leading to a hyperinflationary spiral. In the later stages of such a calamity, hundred billion dollar bills littering the ground is not an uncommon sight. Bitcoin, on the other hand, is intended to simulate a commodity, like gold. There is only a limited amount of gold in the world, and with every gram of gold that is mined, the gold that still remains becomes harder and harder to extract. As a result of this limited supply, gold has maintained its value as an international medium of exchange and store of value for over six thousand years, and the hope is that Bitcoin will do the same. The most recent political revolutions of the late 16th century shifted the power of the political systems of Europe by de-legitimizing the divine right of kings, and enumerating that power into republics. Although there was resemblances of change within the structure of power, what really occurred was a shifting of loyalties, a mutation of the system, and a fracturing of power amongst many actors. Sovereignty was stripped from kings, and that power was divided among the various ideological structures and repressive state apparatuses that make the modern state. Power is no longer centralized within one man (The King), but the government bureaucracy itself. Power, legality, legitimacy, sovereignty, the party as aristocracy, and state-sanctioned violence as a means to execute the law, are all part of this same political-government structure as it was in monarchy. The decree of Divine Right was once used to inflict rule by kings, is now used under the title of civil liberties to give the same violent and destructive powers to a council of men who anointed themselves with the same powers, but for ‘good’. Invariable, man finds himself under the bludgeon, chain, and whip, happy to oblige, for he no longer has one master, but many, and this time they are for good. He fails to recognize that the defenders of civil liberties seek to protect their own rights first and foremost at the expense of his flesh. Violence is the means that compliance with unjust laws are explicitly extorted upon the populous. It is not the justice or majesty of our legal systems that enforces the laws; but ruthless, uncaring, violence legalized in both explicit and hidden forms. It is within the hidden manipulations of what is normal and appropriate that we also find apologists who demand to be ruled as a subjects. If people are to liberate themselves from such an insidious and total system of rule, it must be upon their own merits to help themselves. People must arm themselves with knowledge, and a willingness to think critically for themselves how to manifest a new, better world that shall create a rising tide for all. Digital currencies retreats from this theology of sovereignty via violence through creating a new mode of sovereignty that is intangible and non-physical: The Digital Sovereign. Legitimacy is created from that which is represented and knowable within the digital realm. It cares not for what occurs in the physical world, but only that of which it can experience in the digital world: provable mathematics. Instead of needing to be given ‘legitimacy’ from an authority within the current political or economic system, which would derives its power from sovereign violence, bitcoin creates legitimacy via math. This digital legitimacy is created using a system of communication where each actor can only and explicitly offer encrypted communication, and transaction approval from behind the obscuring and obfuscating walls of crypto. This means that transactions can only be done if someone controls the private bitcoin key, which would be impossible to hack or steal if stored correctly, and it needs no one to validate the legitimacy of the private key, other than the bitcoin software itself. The concept of sovereign is flipped on its head within this new system of digital transactions. No longer are gatekeepers needed to approve your transactions, or allow you access to your money–this is something directly hard-coded into the bitcoin network. Your bitcoin is protected and safe from anyone–there are no longer any Gods or Masters within the financial system when using bitcoin. Now there are only gates, no longer any keepers of those gates to rob you of your money for simply transferring it, choosing to buy with it what you will, or because you have fallen out of the good graces of the state. Money and exchange becomes something for all people everywhere, and no longer a tool for the state to inflict rule with. It is an extraordinary truth that competing currencies have until quite recently never been seriously examined. There is no answer in the available literature to the question why a government monopoly of the provision of money is universally regarded as indispensable. A government monopoly has the defects of all monopolies: one must use their product even if it is unsatisfactory, and, above all, it prevents the discovery of better methods of satisfying a need for which a monopolist has no incentive. The opportunity (for citizens) to use a reliable money that will not periodically upset the smooth flow of the economy is an opportunity of which the public has been deprived by the (presence of a) government monopoly. In 1978 Friedrich Hayek went on to publish a revised and enlarged edition entitled “Denationalization of Money: The Argument Refined“. In this work, he stated his belief that rather than accepting a large range of various currencies, with their own individual merits and demerits, markets would converge on one, or on a limited number of, monetary standards, on which financial institutions would then base the issue of their notes. Bear in mind please that Hayek was writing this in the 1970s, a good two decades before the influential Satoshi Nakamoto paper, first published in 2008. The trail to every great frontier is blazed by those seeking freedom from the current establishment. How dangerous are these criminals who peacefully trade with one-another and then refuse to give a portion to third parties that demand it. Does it make someone a criminal if they rather their earnings go towards their family than a foreign war that destroys foreign families? When did it become a sin for me to want to keep what is mine and a virtue for you to covet what you do not have? A group of rich investors (early adopters) pretending to speak for Bitcoin — all apparently involuntaryists who thus miss the point of the idea of decentralized money — have managed to buy the confidence of many and create an impression of legitimacy, thus becoming the point of contact with the mainstream media, while also becoming friendly to "regulatory authorities", thus effectively increasing centralization. There is no more a Bitcoin "foundation" than there is a Bitcoin "company" or "corporation", regardless of how much members of such a supposed "foundation" or the MSM would like to act as or interface with some kind of representative of Bitcoin. Bitcoin is based on the concept of public-key cryptography. When generating a Bitcoin address (which is, more technically speaking, a hash of a public key), the Bitcoin client (application) also generates a corresponding private key that is mathematically paired to the Bitcoin address (public key hash). Normally, the private key, along with all other private keys corresponding to other Bitcoin addresses, are stored in the wallet.dat file, known as your Bitcoin wallet. To be able to redeem (spend) the coins held by a particular Bitcoin address, you will need the corresponding private key (which, again, is normally, but not necessarily, stored in your wallet.dat file). If you lose the private key (or wallet containing your private keys), you lose your coins — just like with cash. When your Bitcoin client sends a transaction to the network, what it is really doing is sending a mathematical proof of the following fact: this transaction, which states that I am sending this amount of money to this address, was constructed by someone in possession of the private key behind the Bitcoin address I’m sending from. This is the basis for the transactional side of Bitcoin’s security. All you need to get started is to download and install a Bitcoin client, and then sign up at a Bitcoin exchange where you can exchange fiat currencies for bitcoins (BTC). Don't keep funds on an exchange though — they are even less trustworthy than banks. As with precious metals, if you don't physically hold the silver/gold or private keys, you don't really own it. As with banks or any other third-party, all you have is a promise to pay (an IOU). You only own bitcoins if you are the sole guardian of your private keys (i.e. Bitcoin wallet). Bitcoin exchanges, built by crypto-entrepreneurs without the experience and resources of banks — who have professional security audits, risk management teams, etc — are a centralized point of failure that is a huge target for adversaries, so only send money to them when you are going to trade. Bitcoin was built with privacy in mind, but this is not to be confused with anonymity. You don't need an account, a name, or a street address. You can generate an unlimited number of Bitcoin addresses (public keys) to send Bitcoins to and from. So long as you don't disclose personally identifiable information alongside your Bitcoin address (say in a forum or blog), it is difficult to link the Bitcoin address in question with you. However, it has been shown that it is not impossible for a sophisticated adversary (such as the NSA), using heuristic blockchain analysis methodologies, to link identities to addresses, even when being careful. So, contrary to media-spread myths, Bitcoin transactions are not sufficiently anonymous — that is, they are vulnerable to sophisticated blockchain analysis techniques, and they are stored in the public ledger (blockchain) permanently. Some promising protocols built on top of Bitcoin that address this issue are Dark Wallet and Zerocoin and DarkCoin (Dash). There are also "2nd generation" cryptocurrencies like CryptoNote and NXT. See How Anonymous is Bitcoin? for a detailed explanation of the differences between anonymity and privacy in the context of Bitcoin. Many people have a hard time wrapping their mind around how Bitcoins are created in the first place. The process — known as mining, a digital analogy of precious metals mining — is incredibly ingenious and is what solves the otherwise unsurmountable aforementioned problem of fraudulent transactions known as double spends. The systemic purpose of mining is to secure the Bitcoin network by verifying transactions. Miners are awarded a subsidy (newly generated bitcoins, known as the block reward) in the process, which serves as motivation to help secure the network. Bitcoin transactions are stored in blocks, and each block has a dependency on the previous block, hence the neologism blockchain. Miners secure the blockchain by devoting computing power to solving a mathematical "problem" that requires quadrillions of simple trial-and-error attempts to solve. 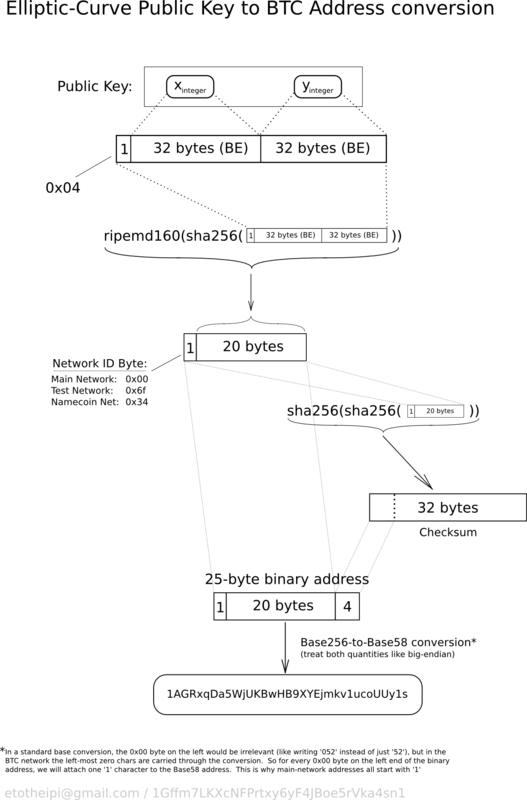 The mining process involves combining a transaction block hash with a random number (starting at 1, called the nonce) and applying a cryptographic hash function (specifically: SHA-256 and RIPEMD-160), until the resulting hash value is lower than the target (hence the block hash will always begin with a large number of zeros). A hash value below the target serves as proof of work that computing power has been dedicated to verify the transactions in the block, and the miner (or mining pool; see below) is rewarded with the newly created bitcoins (the block reward that started at 50 BTC and halves every 210,000 blocks, or 4 years). There is also a difficulty variable (a measure of how difficult it is to find a hash below the target) that adjusts every 2016 blocks (about 2 weeks) in order to keep the average block time at 10 minutes. This is how a Bitcoin GPU mining rig looked, before ASICs took over. The more hashing power — or hashrate, measured in gigahashes per second (GH/s) — a miner can provide, the higher the chance of solving a block, thus generating new bitcoins. It was discovered that graphics card processors (GPUs) are much faster than CPUs for doing these simple calculations, so miners began to use high-end GPUs, which consume a lot of power. Thus Bitcoin mining became a riskier investment. The price volatility made predicting returns impractical, so miners started joining forces, thus giving birth to mining pools. Mining pools link together mining rigs (now ASICs) from around the world, proportionally sharing profits, thus vastly increasing profit predictability. Mining pools unfortunately raise issues of centralization, as in a few cases a single mining pool has exceeded 50% of the total network hashrate. By 2015, fewer and fewer small players remain in the Bitcoin mining game, with specialized mining farms in China and elsewhere with low electricity costs getting a slowly-increasingly larger slice of the hashpower — but not yet enough to worry much about a potential coordinated 51% attack. [30 June 2015] Andreas Antonopoulos explains Proof of Work, cryptographic hash functions, SHA-256, hash difficulty target, game theoretical equilibrium, block validation consensus rules, blockchain forks and orphan blocks, soft forks vs. hard forks, transaction malleability, etc. Bitcoin FAQ - Most questions about Bitcoin are answered here. For more technical information, see the Bitcoin wiki. Unlike traditional currencies, bitcoins are entirely virtual. There are no physical coins or even digital coins per se. The coins are implied in transactions that transfer value from sender to recipient. Users of bitcoin own keys that allow them to prove ownership of transactions in the bitcoin network, unlocking the value to spend it and transfer it to a new recipient. Those keys are often stored in a digital wallet on each user’s computer. Possession of the key that unlocks a transaction is the only prerequisite to spending bitcoins, putting the control entirely in the hands of each user. Bitcoin is a distributed, peer-to-peer system. As such there is no “central“ server or point of control. Bitcoins are created through a process called “mining,“ which involves competing to find solutions to a mathematical problem while processing bitcoin transactions. Any participant in the bitcoin network (i.e., anyone using a device running the full bitcoin protocol stack) may operate as a miner, using their computer’s processing power to verify and record transactions. Every 10 minutes on average, someone is able to validate the transactions of the past 10 minutes and is rewarded with brand new bitcoins. Essentially, bitcoin mining decentralizes the currency-issuance and clearing functions of a central bank and replaces the need for any central bank with this global competition. The bitcoin protocol includes built-in algorithms that regulate the mining function across the network. The difficulty of the processing task that miners must perform—to successfully record a block of transactions for the bitcoin network—is adjusted dynamically so that, on average, someone succeeds every 10 minutes regardless of how many miners (and CPUs) are working on the task at any moment. The protocol also halves the rate at which new bitcoins are created every four years, and limits the total number of bitcoins that will be created to a fixed total of 21 million coins. The result is that the number of bitcoins in circulation closely follows an easily predictable curve that reaches 21 million by the year 2140. Due to bitcoin’s diminishing rate of issuance, over the long term, the bitcoin currency is deflationary. Furthermore, bitcoin cannot be inflated by “printing“ new money above and beyond the expected issuance rate. Behind the scenes, bitcoin is also the name of the protocol, a network, and a distributed computing innovation. The bitcoin currency is really only the first application of this invention. As a developer, I see bitcoin as akin to the Internet of money, a network for propagating value and securing the ownership of digital assets via distributed computation. There’s a lot more to bitcoin than first meets the eye. The largest direct threat to the criminal banking establishment is this still-nascent invention that remains largely mysterious to most people. There is no guarantee that Bitcoin will be the one to dethrone the central banking cartel and its debt-based fractional reserve mega-scam. However, one of its successors almost certainly will. Is Satoshi the greatest troll ever? [Bitcoin Wins] Cry cry cry is all they can do from here on. They cannot comprehend that the race is lost, the word is out and Bitcoin is marching to destroy the ridiculous banking system with old fucks in charge of money. Bye bye OECD, you will suffer from this defeat as well, and we will all enjoy seeing you burn. [Published on Feb 8, 2016] In this talk, Andreas examines the rise of "the blockchain" as an attempt by the banking status quo to dilute the disruptive potential of bitcoin by removing its most interesting features. Andreas Antonopoulos educates Senate of Canada about Bitcoin. In Canada, the public debate surrounding Bitcoin and cryptocurrencies is currently being formalized as the official “Study on the use of digital currency“, a consultative exercise conducted at the initiative of the Senate of Canada’s Banking, Trade and Commerce committee. Although the Senate of Canada exerts less authority than the House of Commons, its standing committees have proven to be an influential source of expertise and opinion. It also enjoys considerable international attention: according to Stuart Hoegner, general counsel at the Bitcoin Alliance, “no other parliamentary body in the world has publicly canvassed the breadth of materials and opinion that this committee has“. Adronis of Sirius says that conventional currency and gold and silver will not play a large role in the future of our money systems, but rather that it will be "more electronic, rather than the idea of physicalized currency, that is beginning to phase itself out". Bashar stays more general, not specifically referring to digital currency: in the fall of 2016, "you will have an abrupt change in your economic situation. You may experience what you call a great economic downturn in what you call your financial structures once again. However, it will have a positive side, this is that it will create a different mindset about the idea of economics, that will begin with a very strong upsurge from a large contingent in your society and in particular in your North American culture, where you will begin to finally let it be okay to explore different ways to begin to arrange your economic system." By 2020, "you will find that many things in your economic system that no longer work for you will really begin to fall away, and that new systems will begin to be discussed and put in place in the beginning of that time frame, so that by your years of 2025-2030, you will have revamped your economic system in a way that will allow you to function far more easily in your planetary global system."